I’m from a family of storytellers. Funny storytellers. I’m a storyteller, too, but not a very funny one. Or so they tell me. Years ago, my sons shared a technique to rescue my stories from a boring finish. At the end of a boring story, they told me to say, “…and then I found 20 bucks.” It’s been useful at times. 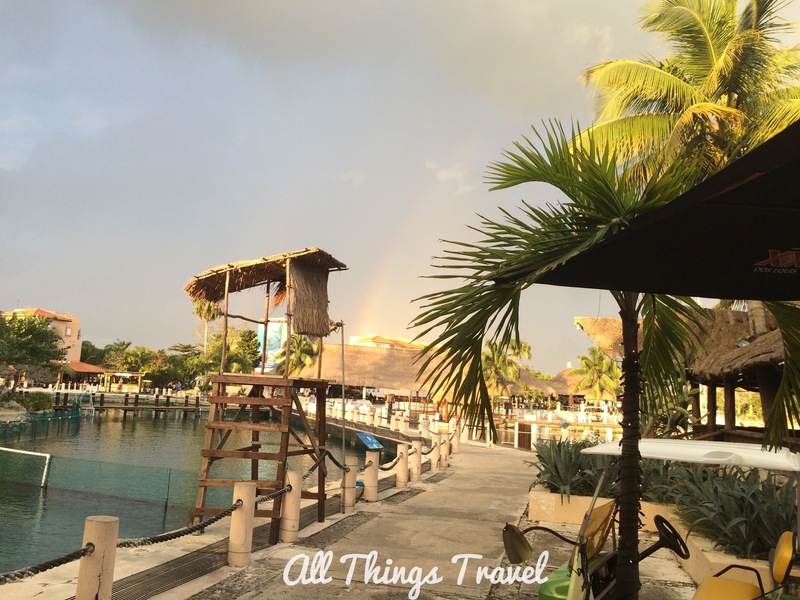 While we were at the Latitude 20 Restaurant enjoying the results of our Mexican cooking class, we asked the women sitting with us about the cenotes in the area. A cenote (say-NO-tay) is a sinkhole created when porous limestone collapses into the underground water beneath it. Cenotes were sacred to the indigenous Mayan people who regarded them as the entrance to the underworld. They were also the only source of fresh drinking water. There are over 7000 of these sinkholes on the Yucatán Peninsula in Mexico and we definitely wanted to see some. 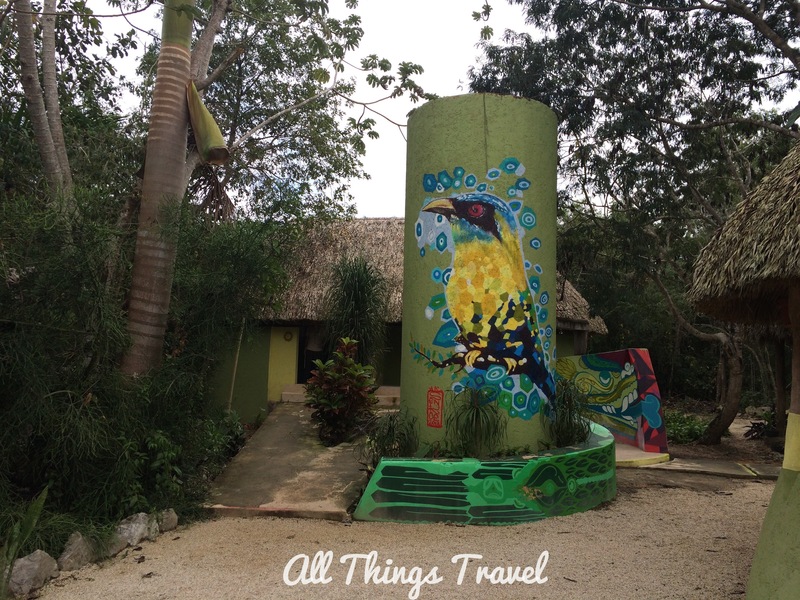 We got a helpful tip from one woman who told us a number of cenotes have been developed into Disney type tourist attractions and we first needed to decide what kind of experience we were after. The adventure parks or private tours in the area cost $100-$150 per person depending on the package which may include a guide, transportation, equipment, and lunch. 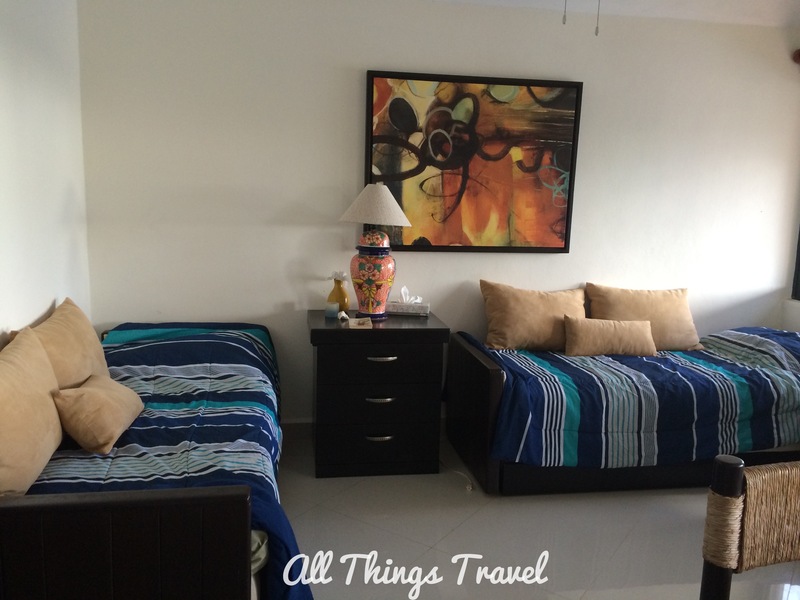 After studying the list of nearby cenotes and their amenities, we chose one that allowed snorkeling and provided minimal facilities including restrooms and a restaurant but not the crowded, popular adventure park atmosphere. 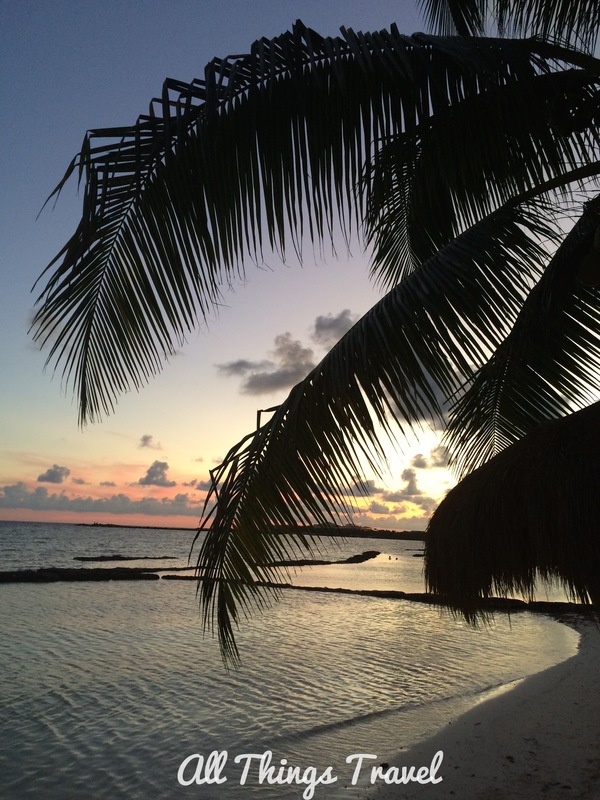 Rather than hire a guide, we opted to do it ourselves at a total cost of less than $25 each. 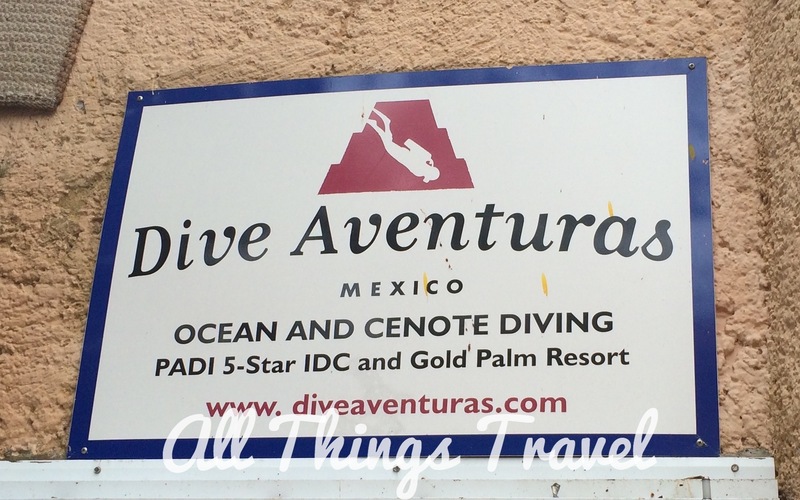 Our first stop was the dive shop to rent our snorkel equipment. We rented the snorkel tube, mask, fins, and life vest for the day for $10. Gail also rented a shorty wetsuit for another $10 as the water in the cenotes comes from underground and can be chilly. 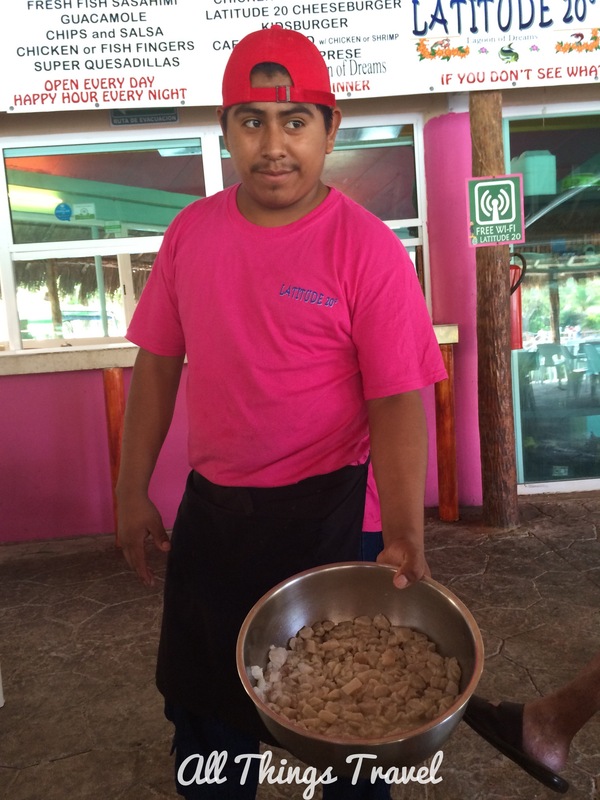 Talking to the staff at the dive shop, we learned that Dos Ojos, the cenote we planned to visit, was closed that day, Saturday, for a Mayan religious observance. 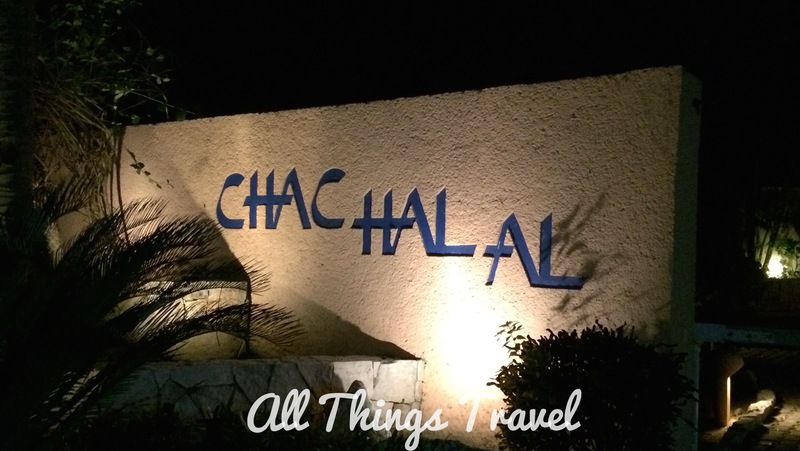 He suggested another cenote, Chikin Ha. So, Chikin Ha it was. On the highway outside Puerto Aventuras we hopped on the local bus, called a colectiva, to ride the couple of miles to the entrance at Chikin Ha. The cost was 25 pesos or about $2. When we got off the bus there was a sign, a ticket booth, and a guy selling tickets. 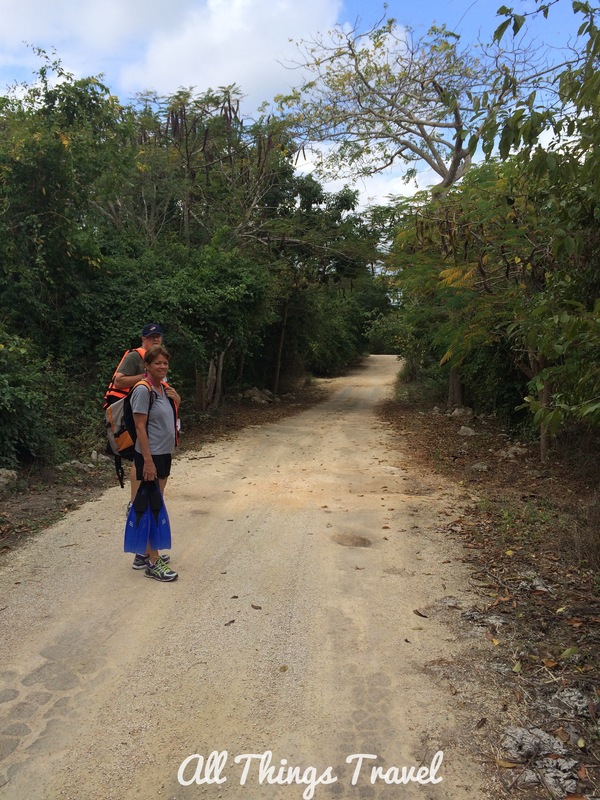 He collected our fee which was about $10 and directed us to walk 15 minutes down the dirt road where he said they would collect our tickets and direct us to the cenotes. We walked, and walked, and walked, toting our equipment and finally arrived more than a half an hour later. If I hadn’t seen signs along the way, I may have questioned whether we’d find anything back there. When we finally arrived, we were somewhat surprised to be almost the only ones there. The ticket taker seemed listless and disinterested and really preferred to talk on her cell phone rather than give us directions. I admit I thought maybe we’d made a bad pick. 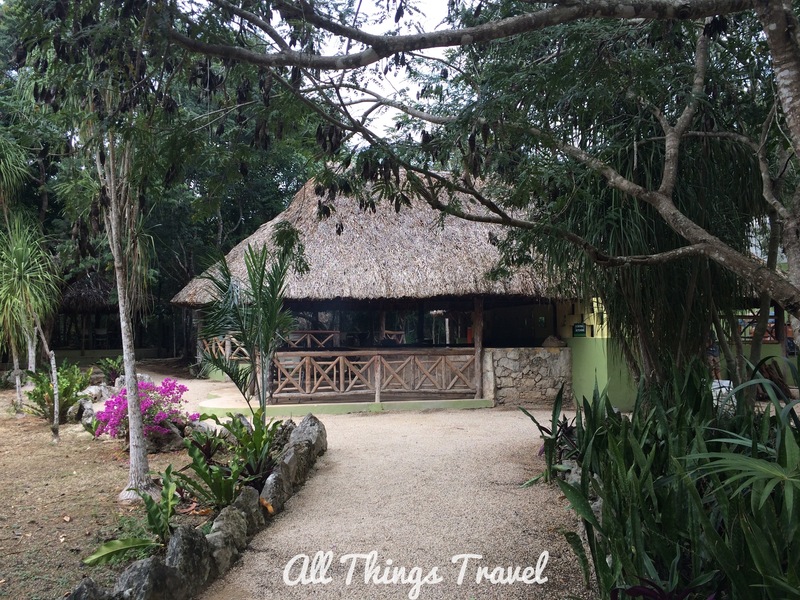 The restrooms were fine, however, so we used them and we were ready to explore the three cenotes in this park. 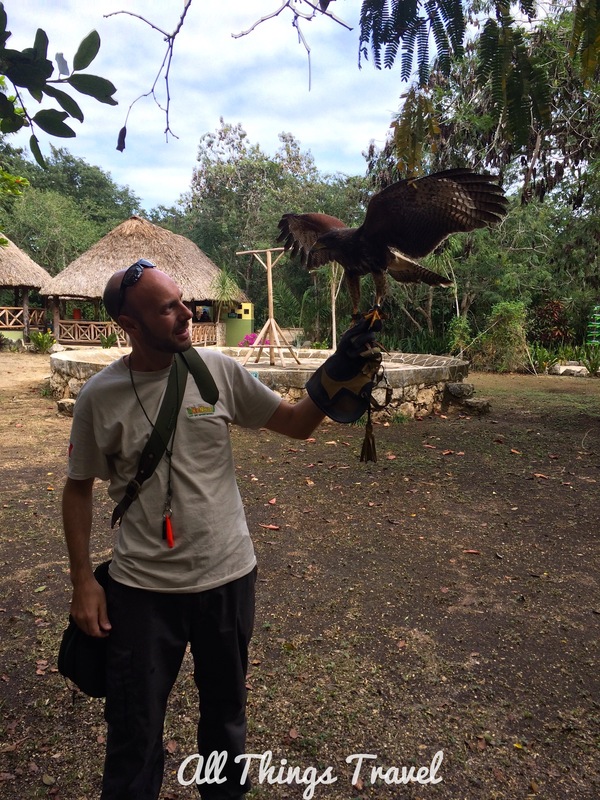 As we walked the path to the first cenote, we encountered this fellow with a Harris hawk. I have no idea why he and the hawk were there. Cenotes range from entirely open, like a lake, to entirely enclosed within a cave and many variations in between. The first at Chikin Ha was open. 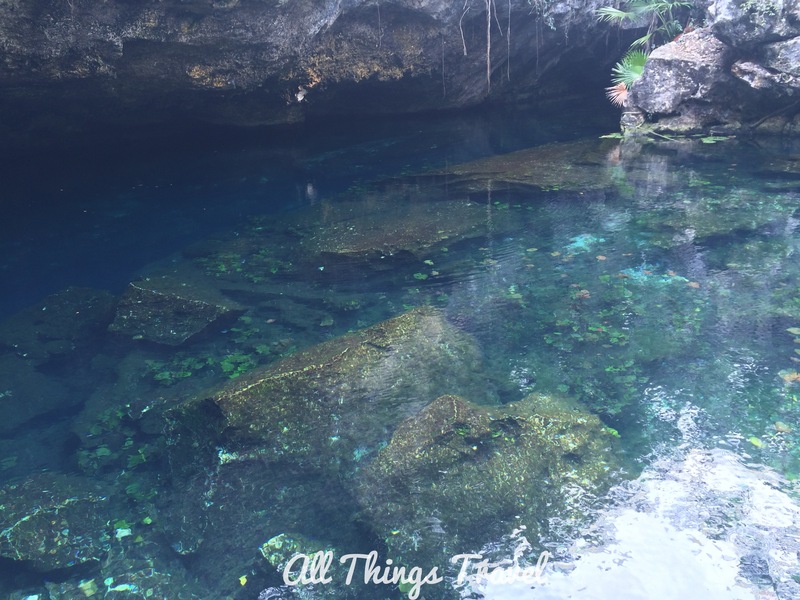 The water was so clear that the limestone rock and fish beneath the surface were easily visible. 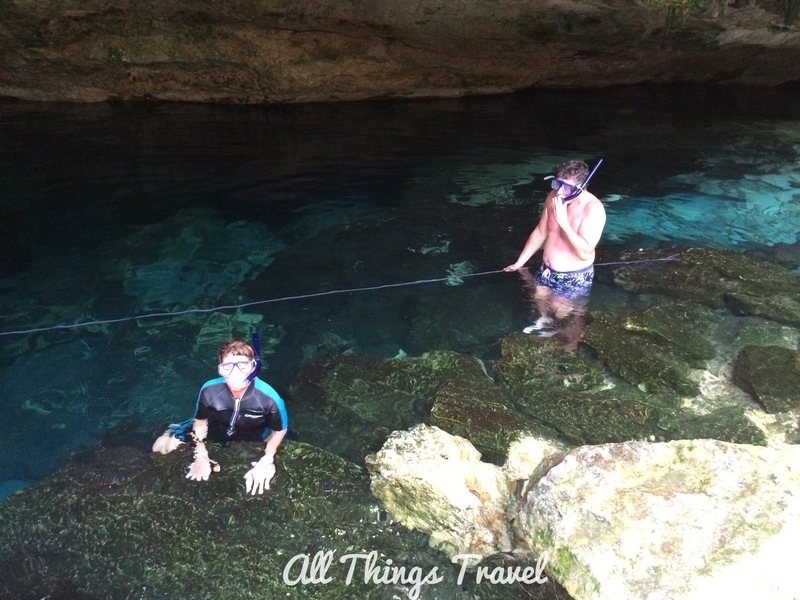 We decided not to snorkel in this cenote and moved on to the second. 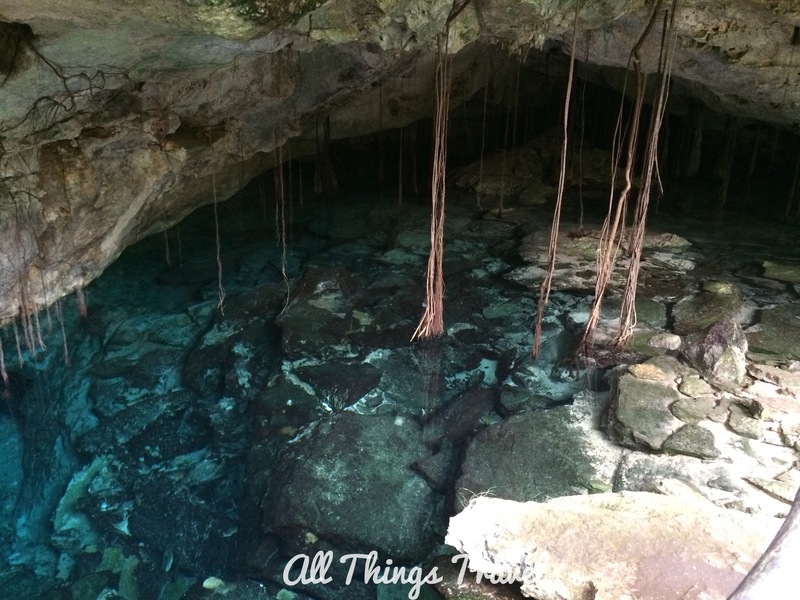 The second cenote was in a cave and we struck up a conversation with the young couple we encountered swimming in it. Hannah and David were from Australia traveling around Mexico and heading next to Cuba. They had been to the Mayan ruins at Chichen Itza, and disliked it as too touristy but they loved the ruins at Tulum because it was the opposite. 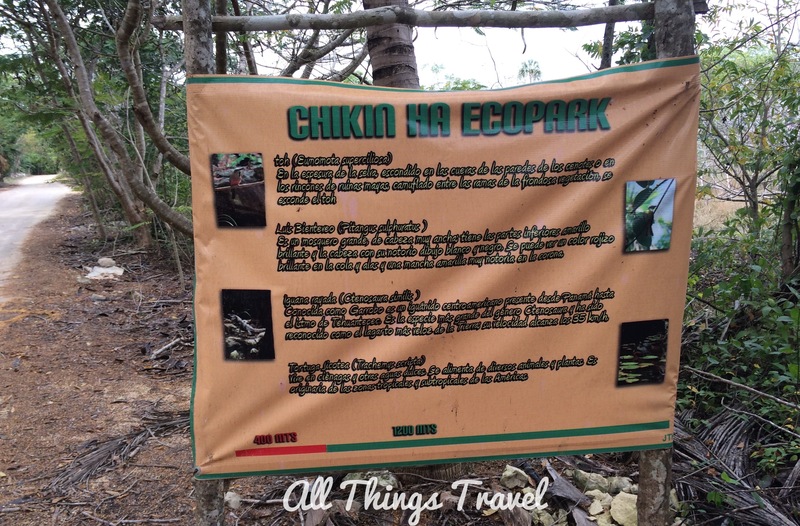 They had talked to someone familiar with many of the cenotes in the area, and picked Chikin Ha based on the recommendation that it was exceedingly beautiful and not so touristy. I felt reassured that maybe this was a good pick, after all! 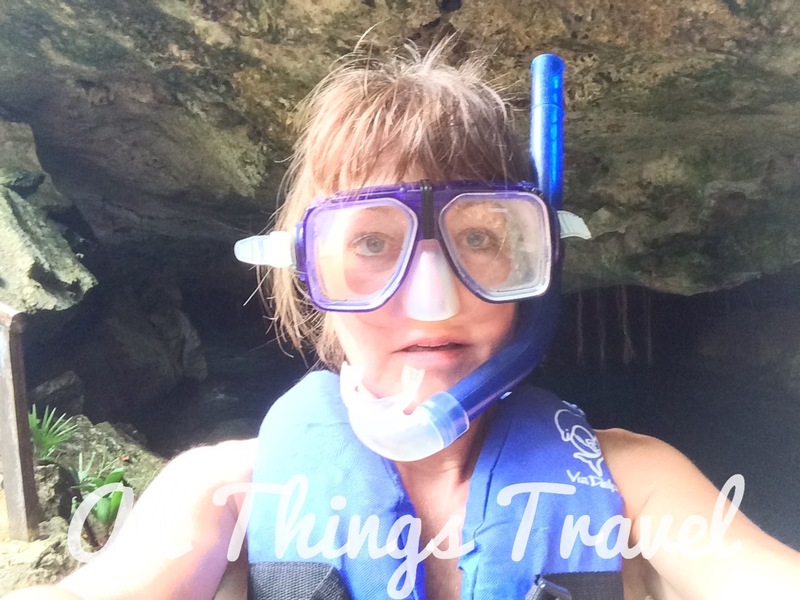 The line that you see in the photo above was very useful for guiding us across the cenote allowing us to keep our masks in the water to see beneath us. 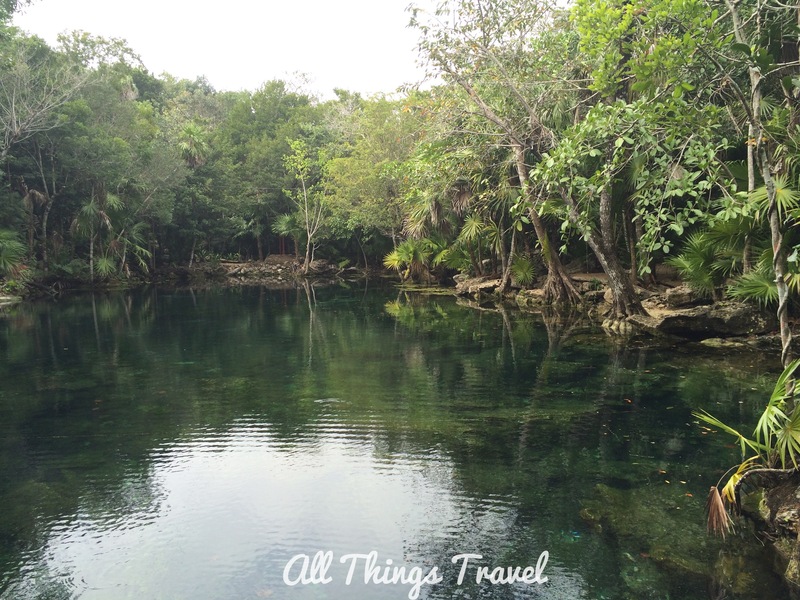 Swimming and snorkeling wasn’t allowed in the third cenote due to its fragile ecosystem. It was probably the most beautiful of the three and we could fully appreciate it without getting in the water. The turquoise color is so amazing and really more impressive than I could capture in photos. There were also many stalactites and stalagmites in this cenote. 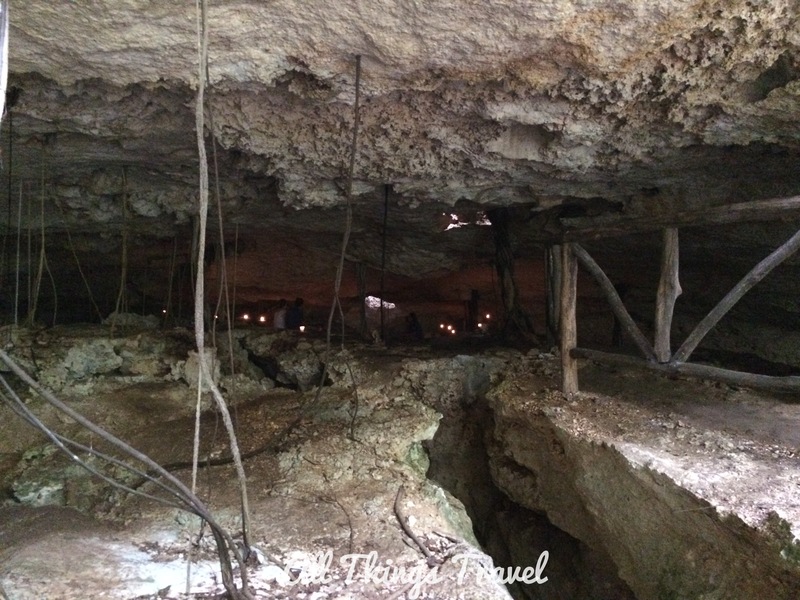 We observed a candle ceremony at the back of the cave of the third cenote. We assumed this was a Mayan religious ceremony of some sort. When I was about to enter the water of the second cenote, I went to remove my Fitbit (an activity monitor) from my wrist and discovered it was gone. I howled to Jim, “Oh no, I lost my Fitbit!” Hannah asked, “What color is it?” I responded, “Orange” and she said, “We found it on the road on our way in!” So, while I didn’t find 20 bucks on this adventure, something even better happened. I call it serendipity. Walking around the marina one morning, Gail and I thought we’d look for a restaurant, Latitude 20, that had been twice recommended to us. 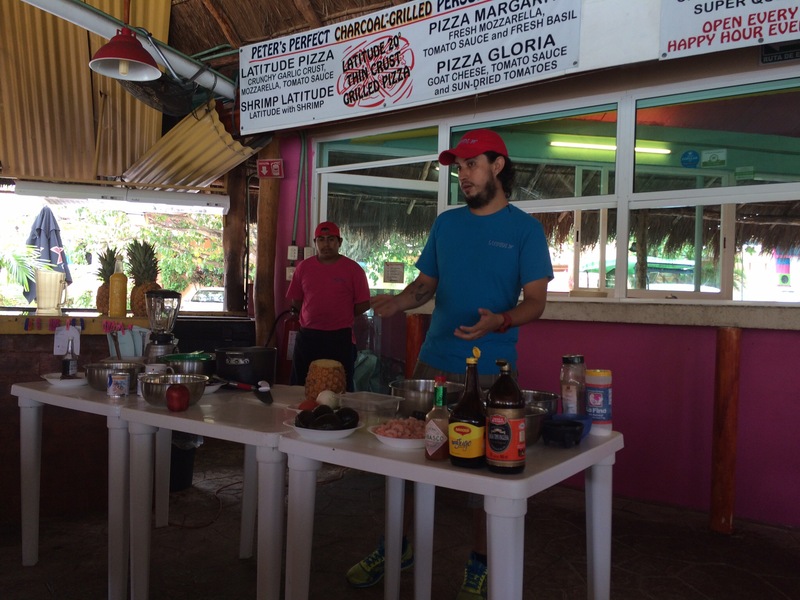 When we found it, a Mexican cooking class was about to begin. 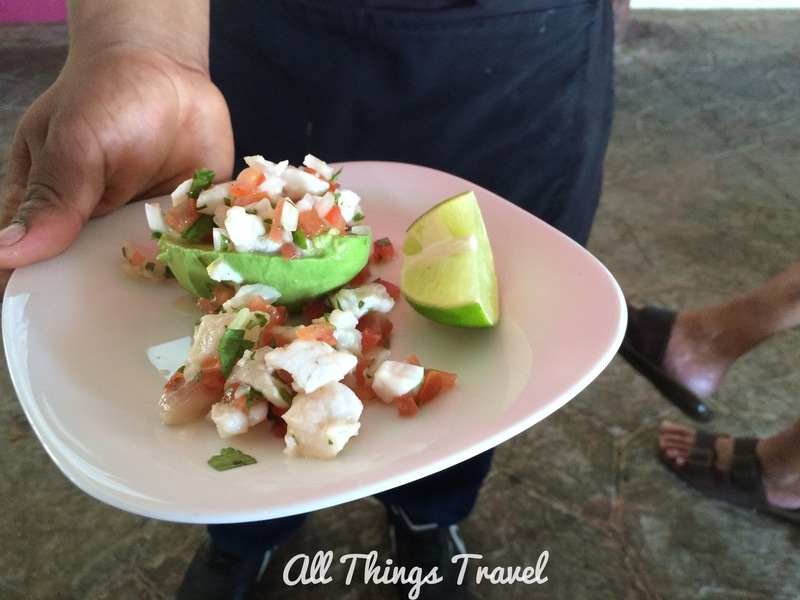 For 100 pesos (less than $7), we would learn to make Agua de Horchata, Ceviche Stuffed Avocados, Mexican Shrimp Cocktail, and Pineapple Casserole, and then get to eat it! 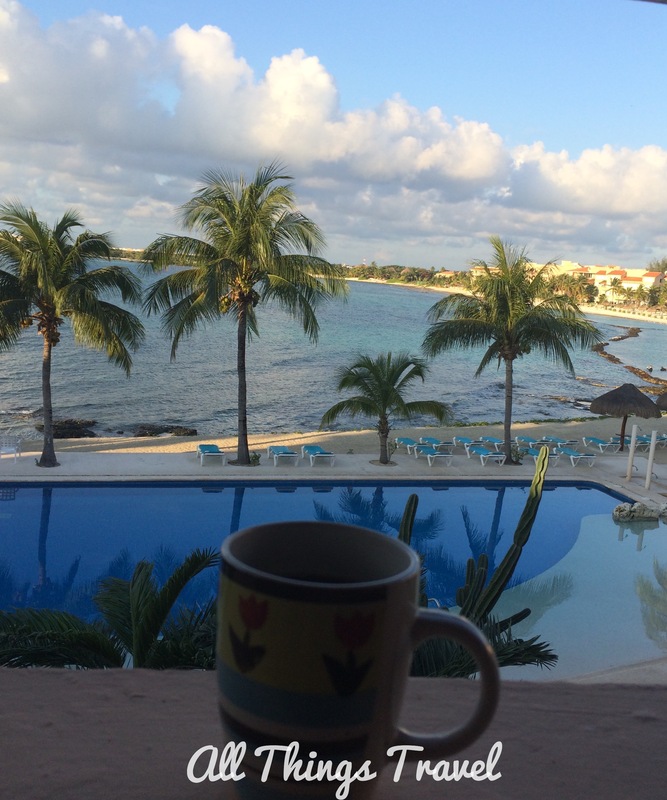 Needless to say, we stayed even though we knew Jim was back at the condo waiting for breakfast upon our return. Some offers you can’t pass up. We had front row seats and watched as the place filled up around us. This was obviously a popular weekly event that we had discovered entirely by chance. 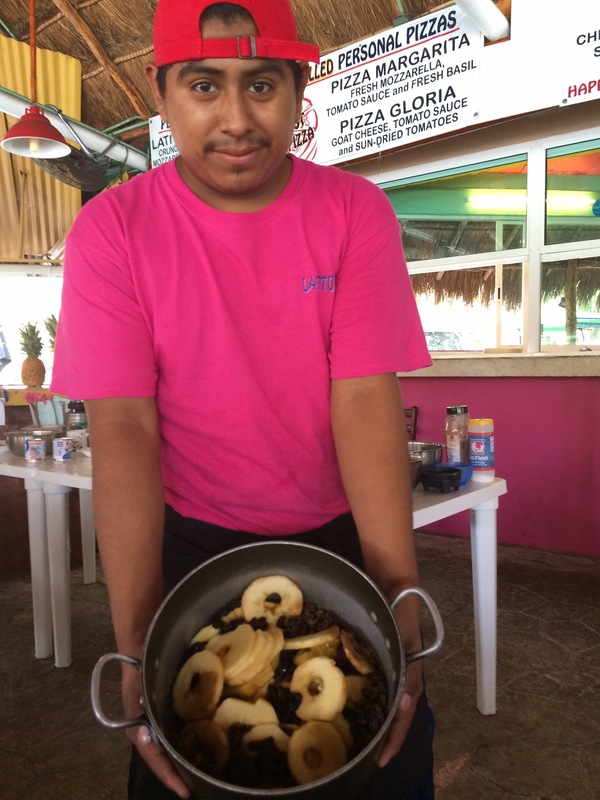 Danny and his assistant, Carlos, started with the dessert, a pineapple casserole that would bake while we made the other dishes. Peel and core the pineapple; slice into rounds reserving the juice. Do the same with the apples. Distribute them evenly in a pot. Add the sugar, raisins, and juice. Let cool and serve with whipped cream. Danny showed us how to slice the ends off the pineapple and core it before trimming the skin off and slicing the fruit. This worked well for him but it presumes the use of a really sharp knife and some skill wielding it. I’ll probably continue to use my old method. Incidentally, he cored and sliced the apples the same way. 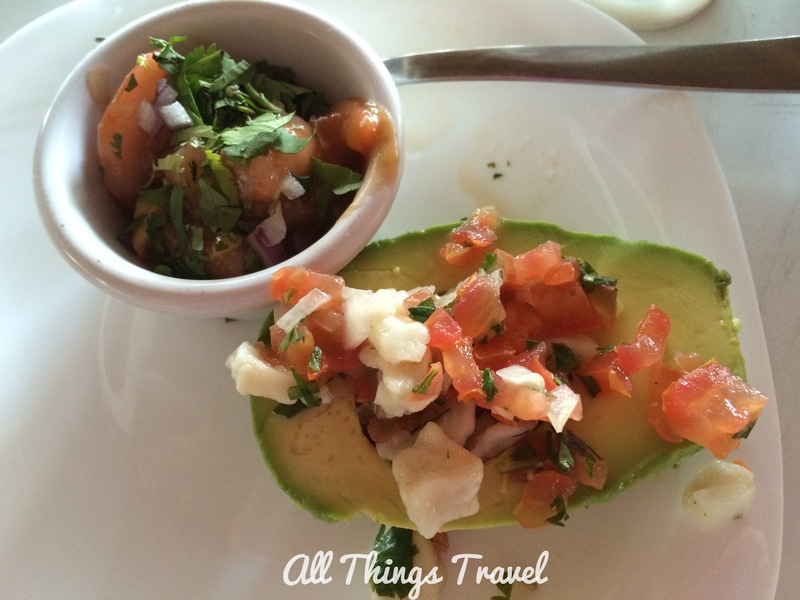 Next up was the ceviche stuffed avocado. 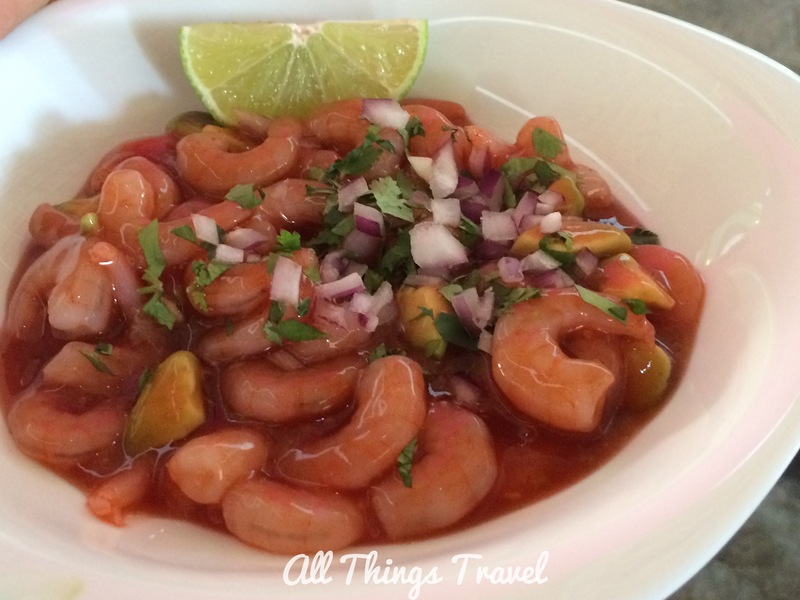 If you’re not familiar with this dish, ceviche (pronounced say-VEE-chay) is raw fish marinated in citrus juice with various other ingredients but typically onion, tomato, cilantro, and peppers. I’m always a little nervous about raw fish but Danny assured us the lime juice “cooks” the fish so it’s really no longer raw. Alright then. Cut the fish into bite size pieces. Season with salt and pepper. Add the lime juice; put aside. It’s best to allow to marinate overnight. Chop the onion, cilantro, and tomato. Add to the fish. Cut the avocados in half; seed and peel. Mix the fish with other ingredients and stuff the avocados. Serve cold. Danny demonstrated how to chiffonade the cilantro so as not to bruise it. Chiffonade is a French word for a technique to roll the herb then chop it. I actually think another method is easier–click here and it’s also from France so it is still très chic! Just be sure to trim the cilantro from the stems first because they are too coarse to eat. We also discussed the type of fish to use in this dish. Danny told us we were using wahoo on this occasion but any mild white fish will do. The Mexican shrimp cocktail included an interesting ingredient, Maggi Juice. I asked Danny what it was and he explained that it’s like concentrated Worcestershire. I took a picture to see whether it’s available in the US. When I googled it, I found it online at Wal-Mart by the case of 24 bottles for $37.76. Mix the ketchup, avocados, juice of 1 lime and the 1/2 orange, Maggi, tabasco, Worcestershire sauce in a bowl. Add the shrimp and mix well. 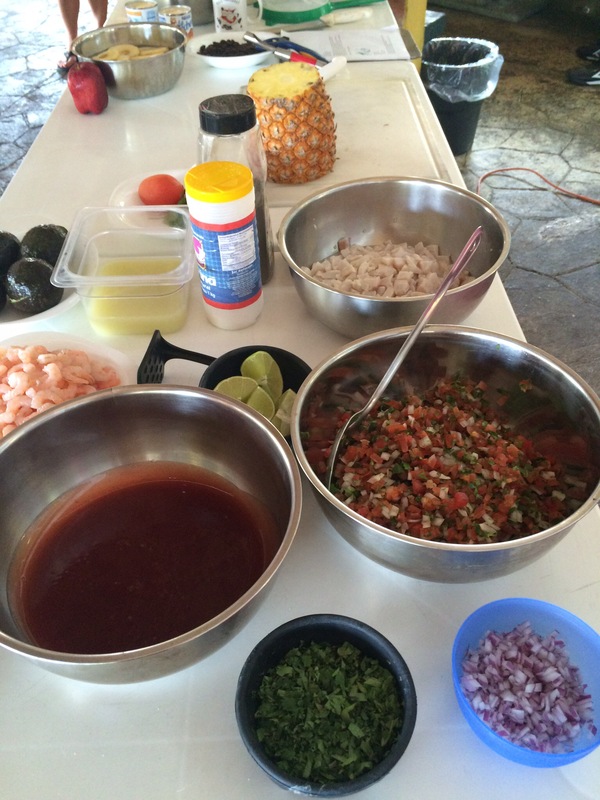 Serve in a bowl or tall glass and garnish with onion and cilantro with lime wedges and tortilla chips. 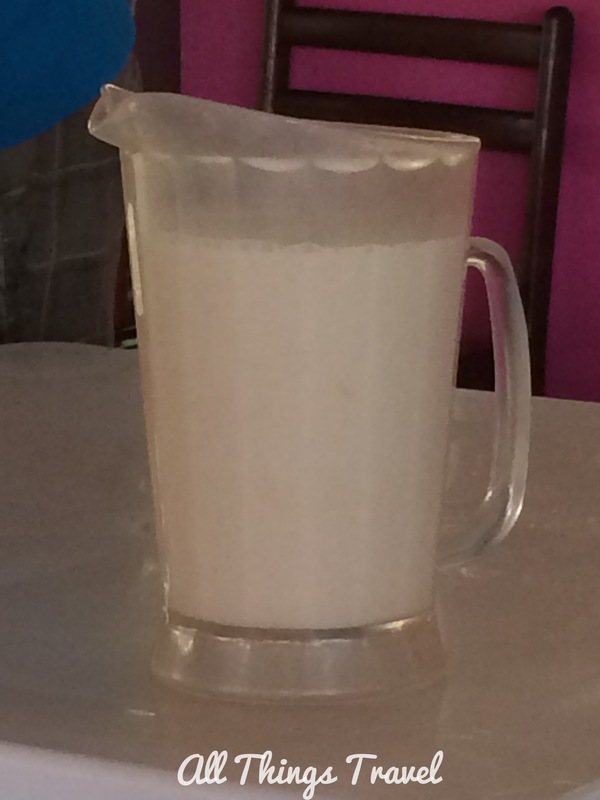 Last but not least, we made the agua de horchata. I’ve heard of this drink before but I had no idea it’s made from rice. It’s not the rice that makes it so tasty, however; it’s condensed milk. Anything that rich will certainly taste good. Rinse the rice. Soak for 1 hour with enough water to cover it. Place in a blender and add enough water to cover by an inch. Add the vanilla and cinnamon and blend until finely ground. Drain the liquid through colander into a pitcher. Return the ground rice to the blender. Add the condensed milk and about 2 cups water and blend again. Drain into the pitcher. Discard any remaining rice. Add more water to the pitcher one cup at a time until it has the right amount of sweetness for you. Add ice and serve cold. 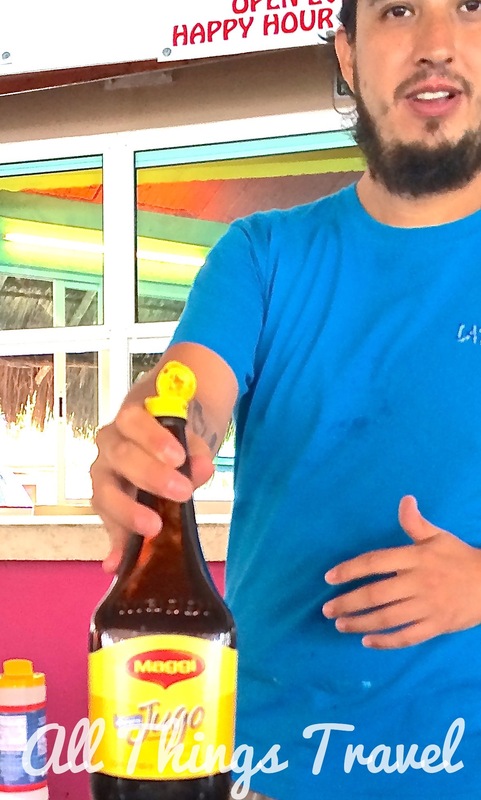 I expected a heavy flavor like an egg nog but the aqua de horchata actually had an unexpectedly light, fresh taste. Once all the dishes were prepared, the staff served us a portion of each. Everything was muy delicioso! We returned for dinner that evening but more on that later. Random House Kernerman Webster’s College Dictionary, © 2010 K Dictionaries Ltd. Copyright 2005, 1997, 1991 by Random House, Inc. All rights reserved. 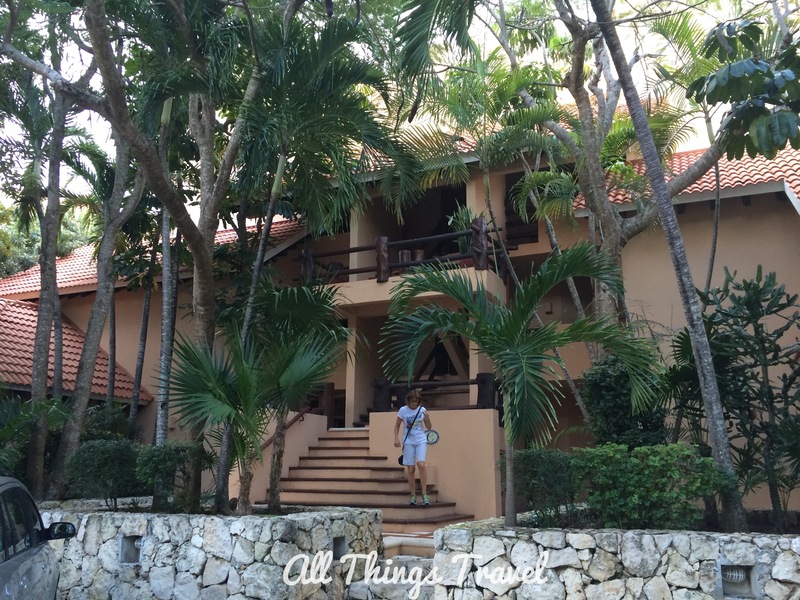 I recently visited a tropical paradise on the Riviera Maya in Mexico and honestly, I was tempted to keep it a secret. I know once I share it, you’ll want to go there, too; then it will be booked up and I’ll have to go somewhere else. But because I have a hard time keeping a secret and I’m so excited about this place, I just have to share it with you. Here’s a picture of our first view from the condo. 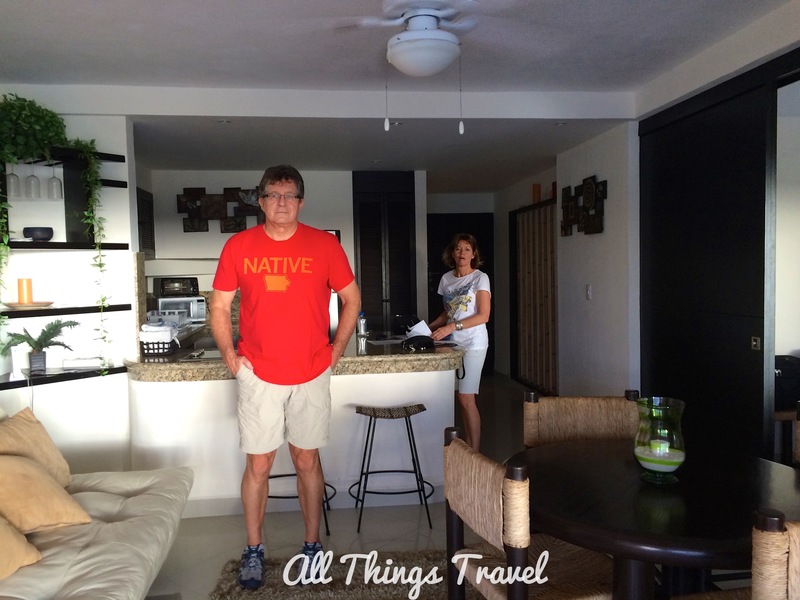 It was already late in the afternoon when we arrived by private shuttle from the airport in Cancun so we decided to look around our accommodations and then explore the complex before dark. 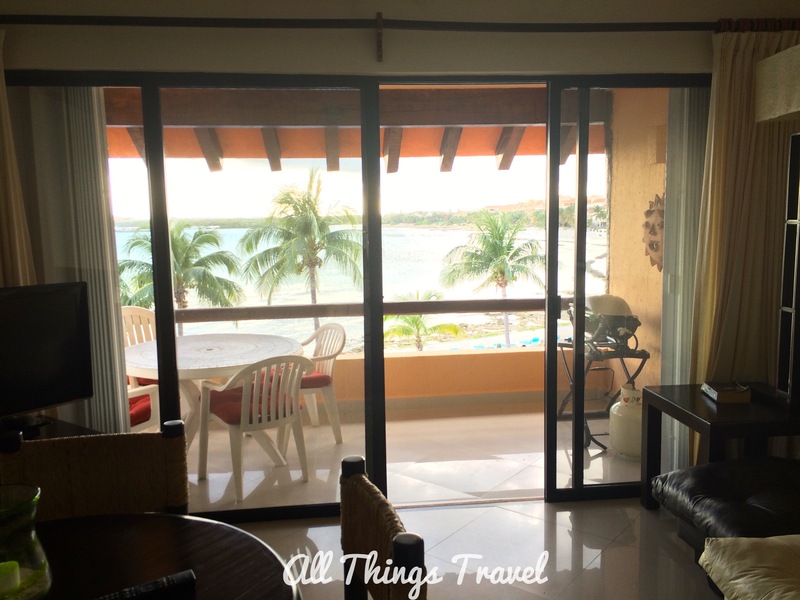 The condo is supplied with everything one would need for a short or extended stay including wifi, a coffee maker, hairdryer, washer and dryer, a grill and even bottled water. There is a flat screen tv that we turned on just once late in our stay to see a weather report. (We’d heard about the epic storm that was hitting the east coast and Gail was scheduled to go through Baltimore.) Housekeeping came in twice to clean although we were there only one week. 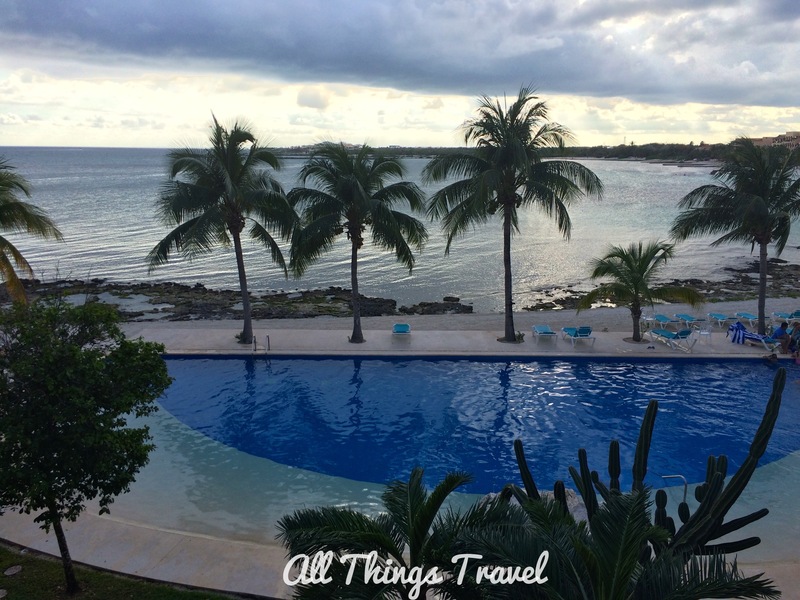 Our first exploration of Puerto Aventuras revealed a gated community with restaurants and shops dotting the central marina. Our condo faced Bahia Fatima on the Caribbean Sea. This map shows the area with Puerto Aventuras resort area east of Highway 307 and the pueblo where the locals live is west of the highway. On our first walk we saw Dolphin Discovery, where you can swim with the dolphins, then we wandered over to the nearby Omni Hotel. 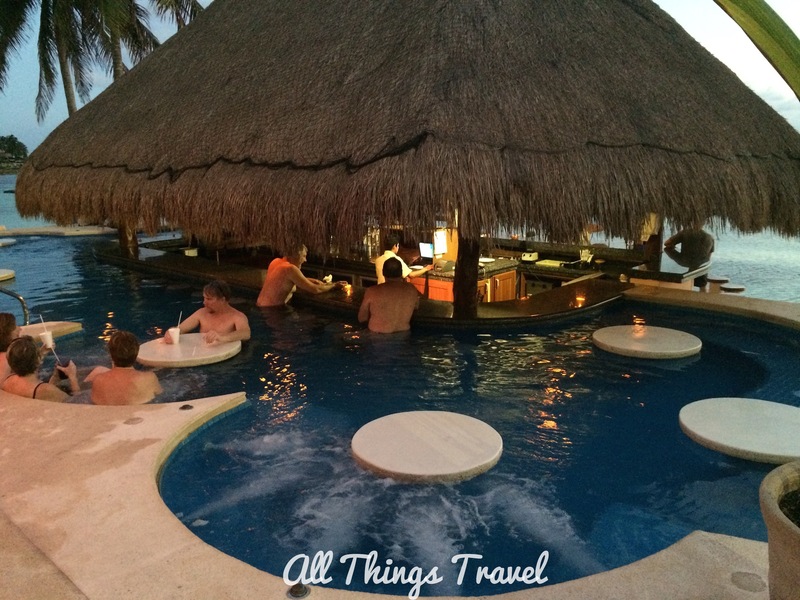 There we discovered their swim-up whirlpool bar that we returned to wearing our swim suits several times during our stay. The next morning here’s what greeted me when I awoke early and had the living area to myself. I didn’t tire of the view during our stay and I’m hoping our friend has already reserved the condo for two weeks next year. If I’ve kept your interest thus far, here’s the name of the place where we stayed. But shhhh. Let’s keep it our secret.